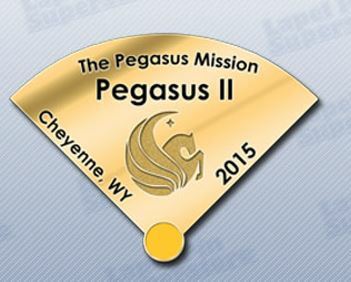 We have the official flight pin for the Pegasus II mission to near space. Team members will be given a pin and we will carry several in the payload to 100K feet to distribute post flight. The flight begins after we connect the craft with our 2000 gram meteorological balloon. The balloon needs to be filled with an exact amount of Helium to provide us with the lift we need to hit our vertical speed target and have enough margin of error to meet of 100,000 foot target altitude. The video and telemetry on the 100 minute trip to target altitude should be spectacular as the craft rises at 5 m/s, i.e., ~17 fps. Once we hit the apex, that’s when everything begins to happen very fast. We must separate the balloon from the craft to begin the descent stage. We only have about 6 minutes from the target altitude before the balloon with expand to its 34.5 foot maximum diameter and burst. We send the DSR command from a Web site run by our Mission Control that feeds into our field gateways and up to the craft. The craft releases the balloon and we begin the first phase of descent. The reason we need to separate the craft from the balloon is that the first part of the descent stage is incredibly violent and we don’t want the bridle that tethers the craft and balloon to interfere with the recovery systems. The first part of the descent occurs with the craft rapidly accelerating using only a 2 foot drogue parachute. The drogue as multiple purposes in the recovery system, but during the first phase of descent its main job is to keep the craft vertical, i.e., antennas point down. The drogue does not produce enough drag to keep the craft from reaching terminal velocity, which initially is about 305 mph in rarified air. Once the craft reaches 305 mph, it begins to decelerate as it encounters denser air during the descent. The craft will descend on the drogue alone for 88,000 feet, which will take only about 13 minutes. While the craft is descending it is transmitting telemetry that we use to determine when the main parachute deployment (MPD) will occur. We have 2 running and redundant processes running in Microsoft Azure that collect the last 30 points of time and air pressure during descent. The algorithm uses these points to plot a least squares line and project where the craft will be in 90 seconds. Once the algorithm projects that the craft will be below 12,000 feet in 90 seconds or less, it computes the time until the craft hits 12,000 feet from its current position and starts a timer. When the timer expires, the process in the cloud sends our field gateways the MPD command, which is sent to the craft. The speed at which this all must happen is extremely important, because at 12K feet, Pegasus II will crash in about 2 minutes unless the MPD occurs. The MPD sequence starts with drogue’s bridle being released from the craft. When this occurs the drogue is putting tension directly on the deployment bag (D-Bag), which houses the main 7 foot parachute. The drogue pulls the D-Bag up, which is tethered to the main parachute. As the D-Bag is pulled up, it pulls the main parachute up and away from the craft and we should get a clean deployment. The main parachute should inflate and slow the craft from about 23 m/s to 5 m/s, i.e., safe enough to land. The craft should descend on the main parachute for about 6-7 minutes. It’s 100 minutes up and 20 minutes down with a the nerve ratcheting deploy of the main parachute sent by the cloud to save the craft with only a few minutes (literally) to spare.